Braxon® allows a muscle-sparing technique and minimises capsule formation and muscle atrophy. Braxon® provides better physiological breast implant control with less pain and fewer complications. The synthesis between the most advanced biomaterial and the most conservative anatomical impact for the patient. Braxon® is a pre-shaped porcine Acellular Dermal Matrix (ADM) designed to completely enclose the breast implant prior to fixation on top of the intact pectoralis major muscle. Suturing of Braxon® around your chosen implant is easily performed on a sterile work surface before introduction into the skin envelope. The Braxon® design easily conforms to the contours of the chosen implant. Braxon® was bioengineered in 2011 in response to reports in the literature of 20-40% post operative, long term complications and high rates of implant loss with submuscular ADM reconstructions. The study of the biomaterial’s regenerative capacity applied together with the constantly ambitious challenges in the field of reconstructive surgery has led to the emergence today of an innovative surgical technique which signals a further enhancement in the field of one-step breast reconstruction. The one-step breast reconstruction, when indicated, has highlighted important benefits for the patient, who recovers her physical integrity in a single operation, together with significant cost savings for the health economy. 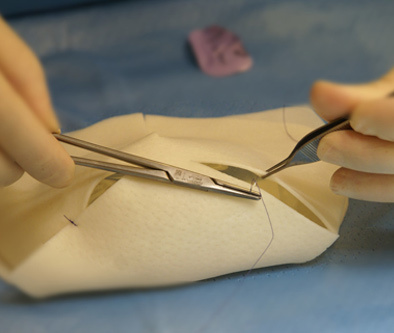 Innovations in the field of biomaterial have contributed in a major way to enabling this new operation to substantially improve the cosmetic outcomes of immediate breast reconstruction. Braxon® is made from a 0.6mm thick porcine dermal extracellular matrix. The proprietary production process has been developed to generate a natural, non cross linked, product without the need for any chemical preservatives which can amplify the inflammatory response and slow down tissue regeneration. The gentle preparation provides immediate bio-availability and encourages incorporation into the host tissue. The result is lower inflammatory outcomes like seroma and red breast syndrome compared to other biomaterials used in breast reconstruction. Braxon® works with the body transforming into native tissue through the natural regenerative process.